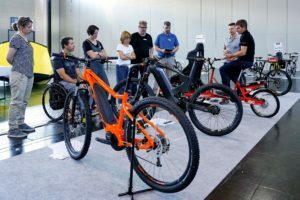 FRIEDRICHSHAFEN, Germany – Although the biggest bike show in the world is still months away, the Eurobike show organizers are already previewing ModelYear 2016 innovations that will be presented in Friedrichshafen. 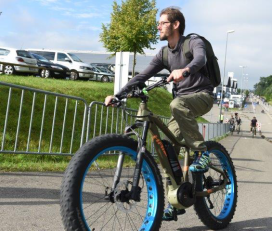 Eurobike, taking place in Friedrichshafen from August 26 to 29, 2015, will display new drive systems for e-mountain bikes and plus-sized tyres. 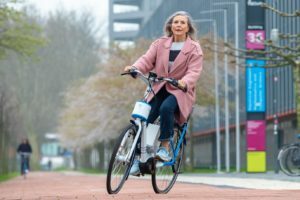 According to the show organizers new, specialized mountain bike versions of the e-bike drive systems will be offered by some manufacturers for the quickly growing e-mountain bike segment in the coming year. Bosch is said to be working on a special MTB variant of its drive system for the 2016 Model Year. Next to that exceptionally thick – but not fat tyres will be highlighted. 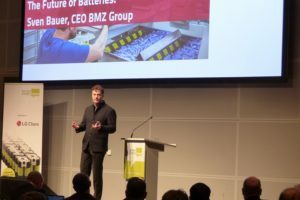 It is said that in the future, the fat tyres, which can be up to 12 cm wide, will be joined by a somewhat thinner version. At 7 to 9 cm wide, this new tyre format, which is designated by a +, lies between traditional MTB tyres and the extra-wide fatbike tyres. In contrast to fatbikes, however, they will not only be offered in 26-inch diameter versions, but also in more contemporary 27.5- and 29-inch versions. The result is a tyre that, with its larger dimensions, is truly a sight to see. Out on the trail, 27.5+ and 29+ tyres offer convincing performance, with a good combination of strong traction and moderate weight. Furthermore, the + tyres – in contrast to fatbikes – are able to accommodate full suspension frames. 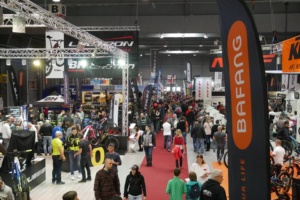 The Eurobike international bike trade show will be open to industry visitors only from Wednesday, August 26, to Friday, August 28, from 8:30 a.m. to 6:30 p.m. and to the general public from 9:00 a.m. to 6:00 p.m. on public day, Saturday, August 29. 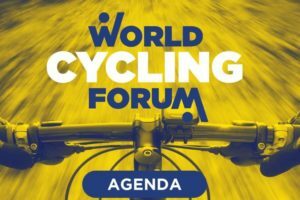 The Eurobike Demo Day will take place on Tuesday, August 25, from 10:00 a.m. to 5:00 p.m. and is only open to trade visitors and accredited journalists. More information is available at www.eurobike-demoday.com and www.eurobike-show.com.